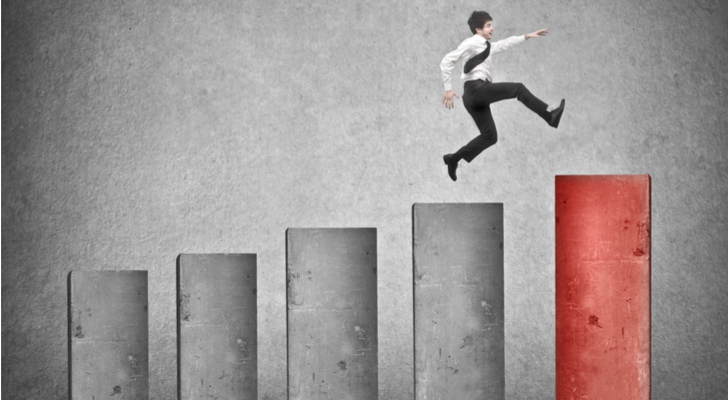 U.S. equities are continuing to push higher on Tuesday thanks in part to comments from Blackrock (NYSE:BLK) CEO Larry Fink that the market was more likely to “melt up” than suffer a selloff. As the head of the world’s largest asset management company, the comments attracted a fair share of attention. His reasoning? 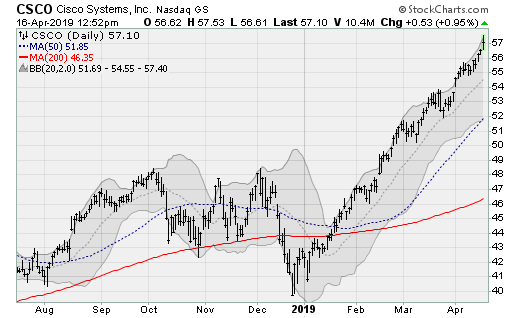 Cash on the sidelines with investors who are underinvested at a time when central bankers are “more dovish than ever.” Also helping the major indices is a rebound in semiconductor stocks, which has been a highlight of the market in recent days. 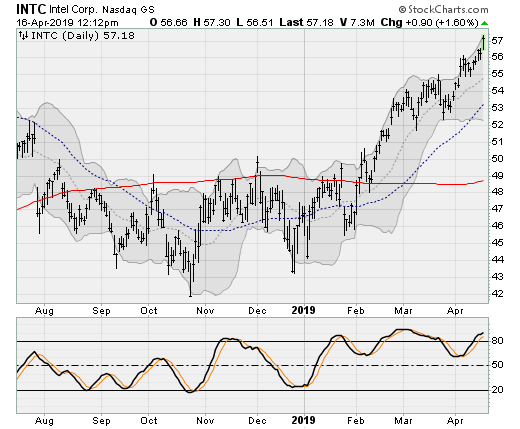 Click to Enlarge Intel (NASDAQ:INTC) shares are extending their year-to-date uptrend and pushing to new record highs after eclipsing levels reached last summer. This marks nearly a 40% rally off of the lows seen in late October and caps an impressively stable run higher. Wells Fargo analysts are eating crow after downgrading shares earlier this month. The company will next report results on April 25 after the close. Analysts are looking for earnings of 87 cents per share on revenues of $16 billion. When the company last reported on Jan. 24, earnings of $1.28 beat estimates by six cents on a 9.4% rise in revenues. Click to Enlarge Shares of Cisco (NASDAQ:CSCO) are enjoying a rock solid rise out of their late December lows that has already bagged a 43% gain for investors as new record highs are set pretty much every day. This continues a move that stretches back to the lows set back in 2011 — during the U.S. credit rating downgrade scare. The company will next report results on May 15 after the close. Analysts are looking for earnings of 77 cents per share on revenues of $12.9 billion. When the company last reported on Feb. 13, earnings of 73 cents per share beat estimates by a penny on a 4.7% rise in revenues. 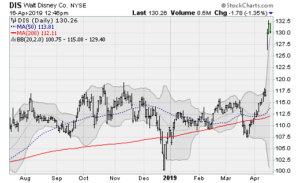 Click to Enlarge Fueled by excitement over the looming launch of its Disney+ streaming service, Disney (NYSE:DIS) shares have enjoyed a near-vertical rise over the past week, breaking up and out of a consolidation range going back to the summer of 2015. That’s a long time to wait as investors wondered whether an aggressive acquisition strategy (Marvel, Star Wars, etc.) would pay off. With Star Wars-themed expansions to Disneyland and Disney World about to open, and with Netflix (NASDAQ:NFLX) on notice, those fears have faded away. The company will next report results on May 8 after the close. Analysts are looking for earnings of $1.55 per share on revenues of $14.5 billion. When the company last reported on Feb. 5, earnings of $1.84 per share beat estimates by 27 cents on a 0.3% drop in revenues. 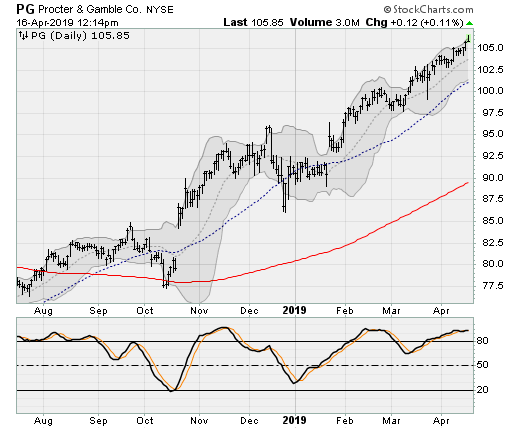 Click to Enlarge Shares of packaged consumer products maker Procter & Gamble (NYSE:PG) are extending a steady rally dating back to last April that has resulted in a gain of more than 50%. The company benefited from a shift toward more defensive issues last year amid broad market volatility, as well as solid management execution in what is a difficult environment. The company will next report results on April 23 before the bell. Analysts are looking for earnings of $1.04 per share on revenues of $16.4 billion. When the company last reported on Jan. 23, earnings of $1.25 beat estimates by four cents on a 0.2% rise in revenues. Article printed from InvestorPlace Media, https://investorplace.com/2019/04/4-stocks-to-buy-now-before-they-skyrocket/.